Alright, you already know my thoughts about chain restaurants - not usually my first choice of dining destinations. Generally generic and uninspiring, chain restaurants do serve a purpose. In fact, there are a select few that I actually don't mind. Cactus Club is one of them (despite the high prices) and White Spot (due nostalgia and being kid-friendly). 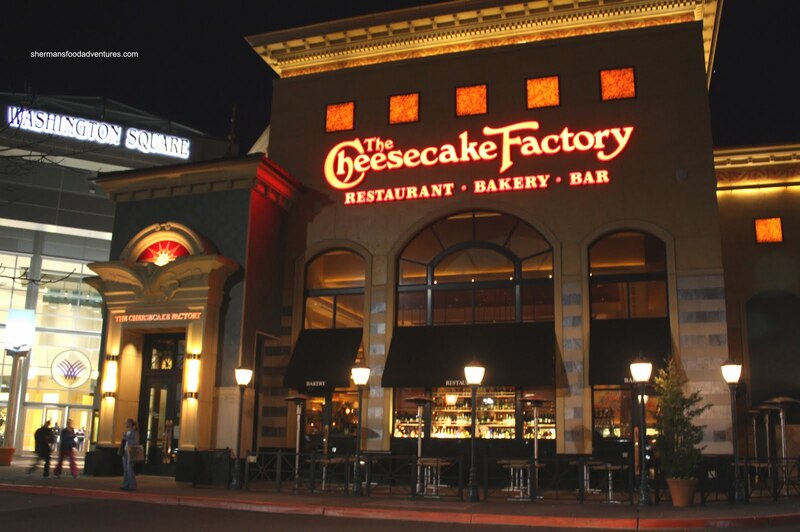 One other chain restaurant that I have nothing but love for is The Cheesecake Factory. Yah, I'll admit it and I'm willing to defend it too. I've eaten there many times and I've never come away disappointed. Naturally, they are famous for their cheesecakes, that is a given. They are also kno wn for their extremely large and diverse menu which has a little of everything. Oh, and of course, the portion sizes are generally quite large as well. But then again, this is the US we are talking about, so that would just be normal. 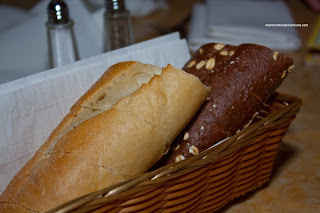 The last time we visited the Cheesecake Factory, it was on Black Friday in 2008, when I first starting blogging. Unfortunately, I was using my Blackberry and the photos were as nasty as the floor of a Chinese restaurant washroom. Hence, I've been dying to do a return visit for awhile now. After doing some shopping at Washington Square, we were originally gonna hit up some sushi; but it appeared that there was only sushi on the menu which didn't really sit well with the kids. 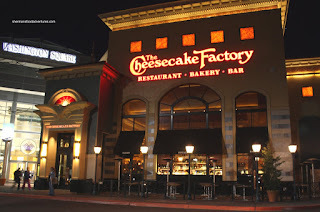 So we ended up returning to the mall and headed to the Cheesecake Factory. Since my last visit, they have finally added a kid's menu. I guess the multitude of families visiting the place gave them a hint. And guess what my son selected as his kid's meal? 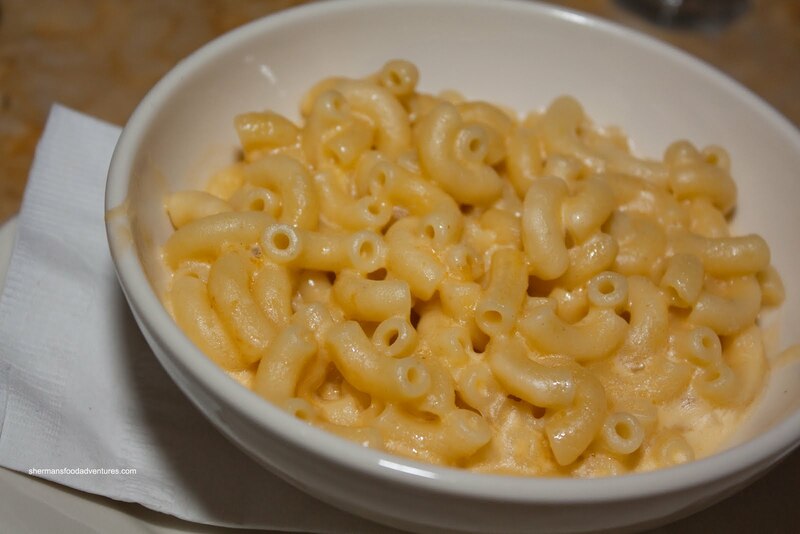 Yes, Mac 'n Cheese. He might as well try out for Kraft Dinner commercials. For a kid's meal, this mac 'n cheese was pretty good. The noodles were towards the al dente side and there was plenty of seasoning. There was just enough creamy cheese sauce to coat the macaroni without soaking it. 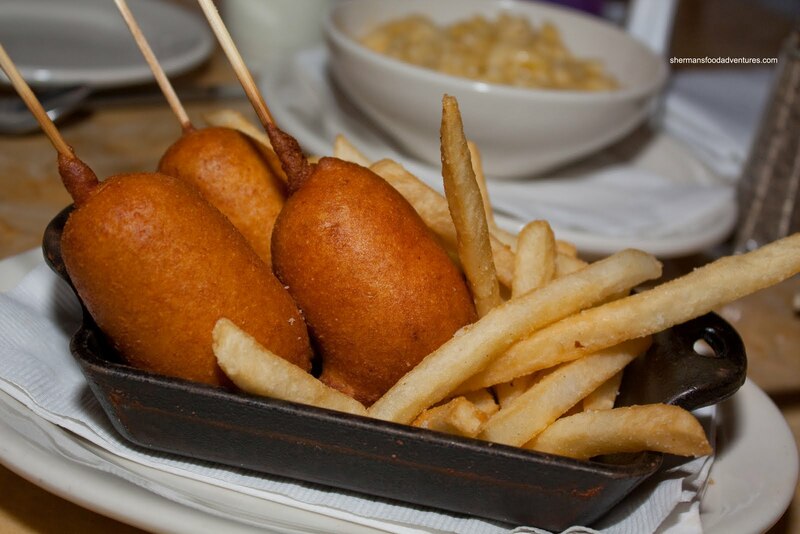 We got the Mini-Corn Dogs for our daughter and we think she ate some of it. She makes such a bloody mess, we're never sure if she ate anything or if she merely made a "Cookie Monster" mess. Despite looking cute, these were little nuggets of death on a stick. The wiener inside was really oily and salty while the batter was equally oily. I guess some kids would like these. 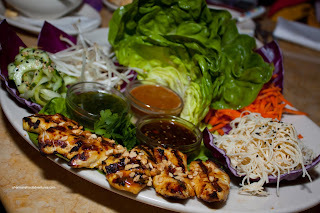 As for Viv, she went for something "lighter", if there is such a thing here in the Thai Lettuce Wraps. This is actually an appetizer which she ended up ordering as her meal. Essentially a build-it-yourself dish, this is "fun" food. 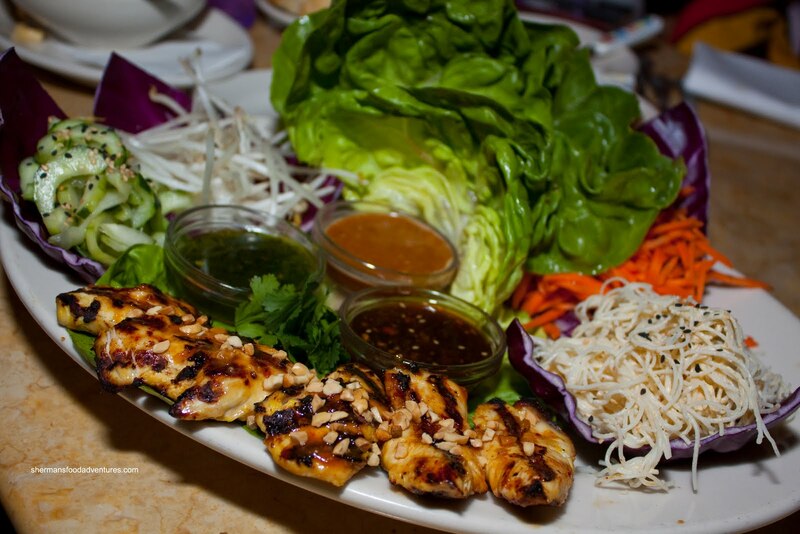 If the veggies are fresh and the chicken is cooked properly, you can't really go wrong. It consisted of satay chicken, carrots, bean sprouts, coconut curry noodles and lettuce leaves with three sauces including peanut, sweet red chili and tamarind-cashew. The sauces were quite good except for the tamarind-cashew, it tasted like liquid candy. Since I've had nearly everything good on the menu including the Miso Salmon, Chicken Madeira, Chicken & Biscuits, Garlic Noodles, Shrimp with Angel Hair, Bistro Shrimp Pasta, Shrimp Scampi and Fried Mac 'n Cheese, I decided to go for one of their featured items. For some reason or another, I didn't write down the name. I believe it was the Spicy Shrimp and Rice. Whatever it's called, I do know is that it resembled a shrimp gumbo. 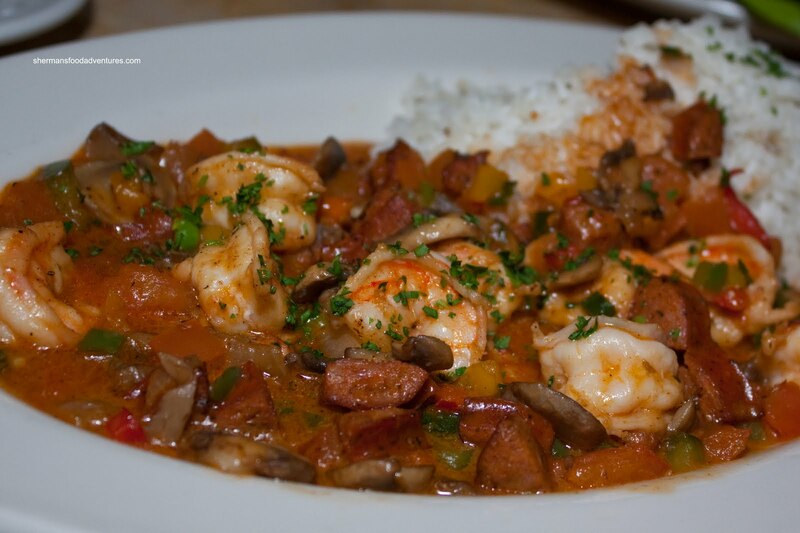 As you can see, it is a combination of shrimp, sausage, peppers, onions and mushrooms in a spicy sauce. I quite liked this dish since there was plenty of properly cooked shrimp within a spicy, rich sauce. 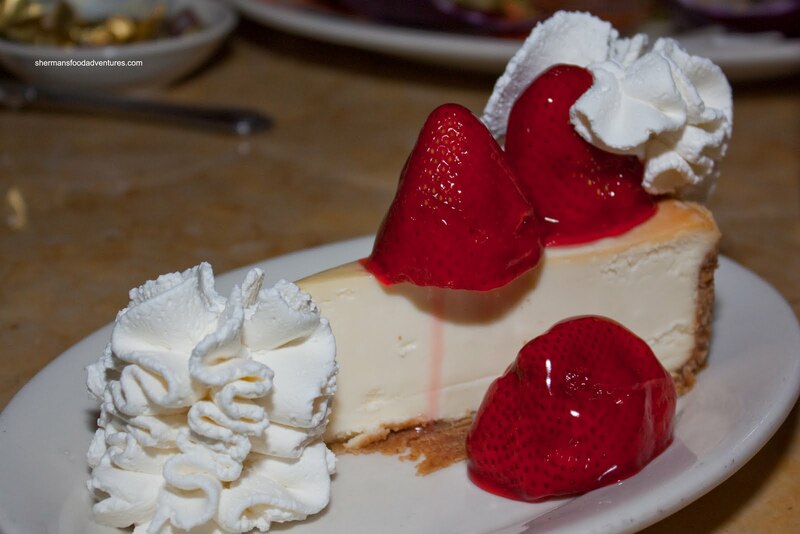 Now a visit here would not be complete without a slice of cheesecake. Despite being quite full, I pulled a Mijune and got the Original with fresh strawberries. The cheesecake here is baked; yet at the same time, it is not too heavy. As a dessert, I don't personally find it too sweet, so I can get a nice cream cheese hit. Unlike many other places, the strawberry topping is fresh. Well, another good meal at the Cheesecake Factory. I don't care what other people say. - When is there not a lineup? I think their chicken entrees and pastas are pretty solid every time I go hehehe! I used to enjoy them, until I did a take home - and noticed that my tomato-based pasta had solidified into a solid mass of congealed grease after about 1/2 hour in the car. That was enough to turn me off for good. That being said - LOVE their cakes! I went to the the one in Vegas and was so surprised at how good it was.... I was expecting generic bland food and instead really enjoyed the food.... and the price.... especially for Vegas..... on the Strip. I think Cheesecake Factory is about the only Chain restaurant that I like, especially the cheesecake. In fact it's my favorite. I feel very similar about chain restaurants (never been to a CF) and I laughed at your description of your old photos..... I also cringe when I look back at my first food photos taken back in 2007-08 with a piece of crap point and shoot. What equipment do you use these days? I shoot Nikon. @eeScorpius Yes, I love their pastas! Especially the Shrimp and Garlic Noodles! @Anonymous Yes, it is surprising for a chain restaurant eh? @Jenny Agreed, love their cheesecakes and I'm not a dessert guy either! @Antonio Correia I wonder if one will ever be opened up here? I wish they would! @Kristi I used a Canon XSi with either a stock 18-55mm lens or prime lens. I really need a new camera!